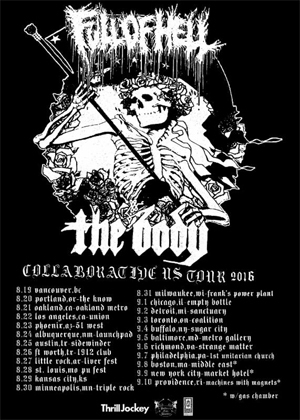 THE BODY and FULL OF HELL are pleased to confirm a collaborative North American tour in support of their One Day You Will Ache Like I Ache joint full-length, issued in March through Neurot Recordings. The nihilistic live takeover begins August 19th in Vancouver, British Columbia and tramples its way through nearly two-dozen cities, the tour drawing to a close on September 10th in Providence, Rhode Island. The journey will find both bands executing their sonic deviance as one unit, as well as performing new versions of old songs from each of their respective discographies. The latest run of dates follows the bands' concerted European invasion this past April. One Day You Will Ache Like I Ache came together during last year's monolithic North American trek which united both bands. Amidst the chaos of tour life, the two groups found time to record together at Machines With Magnets in Providence, Rhode Island. The session eventually culminated into the harrowing sounds found on One Day You Will Ache Like I Ache, which is ultimately an audio reflection of their surroundings and their inability to cope therein. The record includes two bonus tracks as well as a bastardized rendition of Leonard Cohen's "The Butcher".